I've had a chance to do a few PSC's recently and thought I'd post one that was a little more involved. It's a 9 card PSC Battlestar Galactica puzzle. 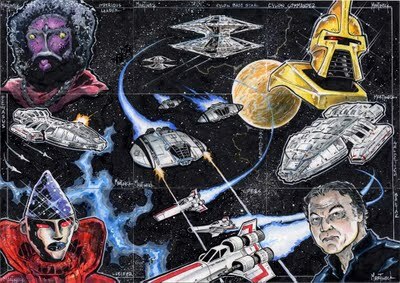 I've posted it and many other pics, images and Sketch cards from the past few years in a thread of mine at the Scoundrel Art Forum, Warren Martineck, The Works... If you haven't seen it yet, stop by and check it out as I update it on a semi regular basis. That's it for today. I know it's Friday but I'm out of the studio for the rest of the day so you'll just have to wait for next Friday to get casual. Where have the posts been? On Vacation with me and the family. It was a long awaited break from work with no Pencil, phone or email contact. Though that might be the last time I do that in this Freelance business. 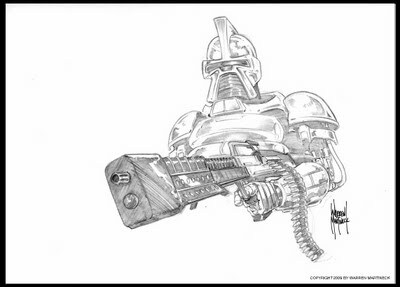 warm up on, I decided to dig into some new "old" Cylon badness and add a new posting too. Starting up cold, I spent more time on this Friday piece than usual, but really needed it. I did a few extra thumbnails to get what I was shooting for. This was one I originally thought was good, but after looking at it a bit, it wasn't what I was picturing in my head. *Drawing tip - If your using reference to draw a picture, don't let the reference take over the drawing. Rough it without the reference to get something different and cool, then go back in and touch up details with the reference. Then it becomes your picture, looks accurate, and not like just a copy anyone could have done. I forgot that when I drew the above pic and redid it with that in mind. I think the final, although not that much different, came out much more interesting. 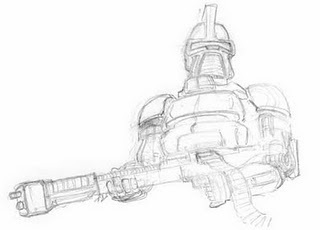 "Cylon And A Big Gun"